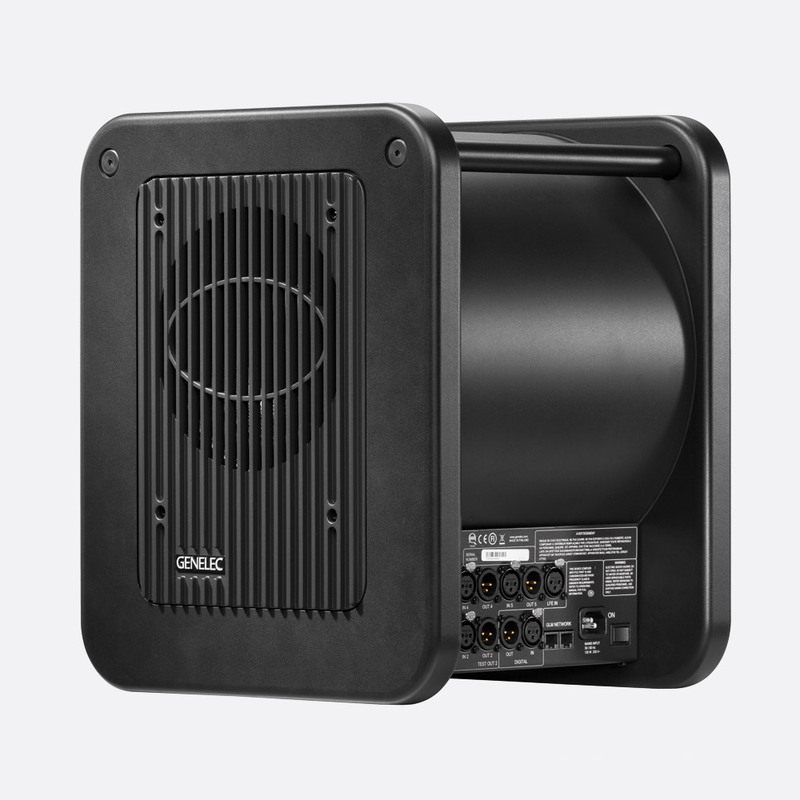 These active, sub-bass speakers are part of the Genelec SAM series and have been designed to complement 'The Ones' range of monitors, to offer a complete audio system for studios and home theatre setups. With models ranging from 150W to 800W, they use Laminar Spiral Enclosure technology; the bass-reflex cabinets, made of sheet metal, are rolled into a a spiral shape to provide excellent laminar flow characteristics with minimal turbulence noise. 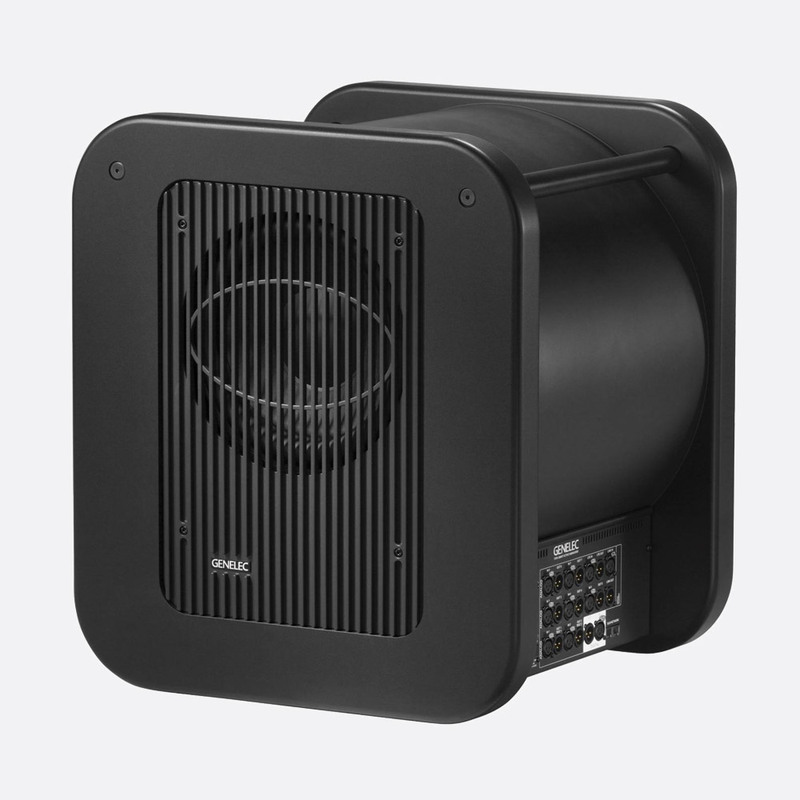 This 8-inch sub-woofer has been designed to complement the smaller of the SAM series monitors to provide a fuller sound within a compact footprint of 410x350x319 (HxWxD) mm. The class D, 150W amplifier produces frequency response of 22Hz to 100Hz, or 22Hz to 160Hz, with LFE active. All connectivity is on the right side of the subwoofer, including five balanced analogue inputs via 3-pin XLR connectors, with corresponding balanced outputs. An LFE (Low Frequency Effects) input channel provides for the connection of a dedicated sub output from a compatible receiver or amplifier.Digital (AES/EBU) I/O is provided by 3-pin XLR connections and network I/O connectivity to the GLM network adapter and other monitors is by way of two RJ45 connections. The AC mains power connection is an IEC inlet and power on/off is via a latching rocker switch. An illuminated LED positioned above the IEC input signifies power on.ISS (Intelligent Signal Sensing) senses when the loudspeaker has not received any audio input for a period of one hour, and switches the loudspeaker into sleep mode, consuming less than 0.5W. When an input signal is detected the monitor resumes normal operation and power consumption. ISS is disabled as factory default and can be activated using GLM software. The 7360A has a class D, 300W amplifier which powers a 10-inch driver to produce an output of 109dB SPL with a frequency response of 19-100H, or 19-150Hz with LFE active. Like the 7350, all connectivity is on the right side of the subwoofer, including seven balanced 3-pin XLR analogue inputs with corresponding balanced 3-pin XLR outputs, a LFE (Low Frequency Effects) input channel to allow the connection of a dedicated sub output from a compatible receiver or amplifier and an LFE output for linking via 3-pin XLR. Link in and out connections are provided via balanced 3-pin XLR while digital (AES/EBU) I/O is also provided via 3-pin XLR connections. Network input and output connectivity to the GLM network adapter and other monitors is by way of two RJ45 connections. Miniature (DIP) switches allow the configuration of bass roll-off, phase, digital LFE, test tone, and 'Stored' in which the settings can be overridden with those preset using GLM software. The AC mains power connection is an IEC inlet and power on/off is via a latching push switch. An illuminated LED positioned above the IEC input signifies power on. ISS (Intelligent Signal Sensing) senses when the loudspeaker has not received any audio input for a period of one hour and switches the loudspeaker into sleep mode, consuming less than 0.5W. ISS can be enabled/disabled via a dip switch on the control panel of the speaker. A 'Bypass' socket, 6.35mm jack, provides a connection for a compatible open/close device to bypass the bass manager. 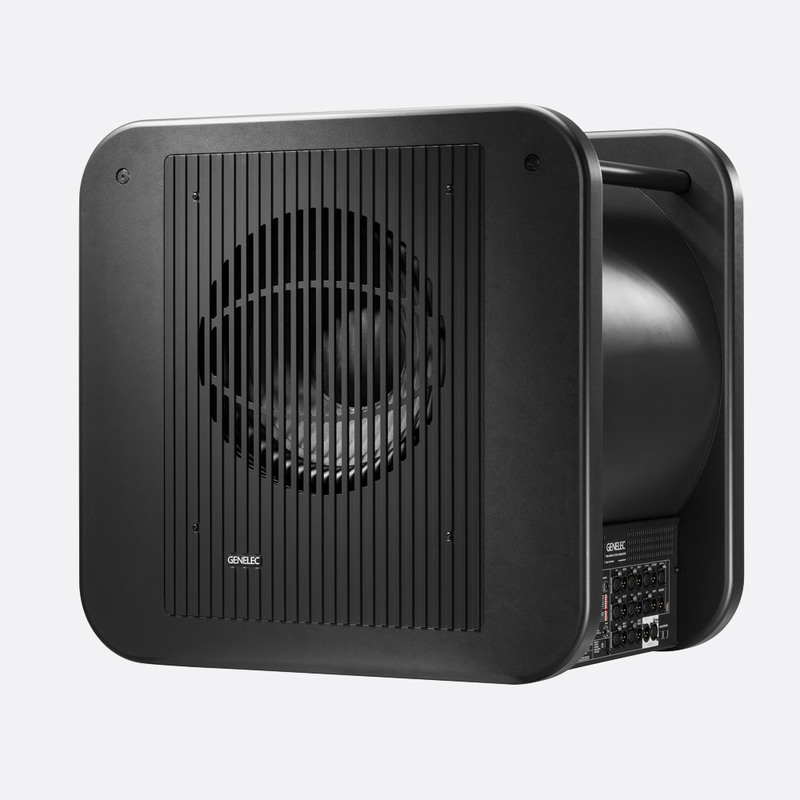 The 7370A SAM subwoofer has the same functionality and frequency reproduction of the 7360A, however a 400W class D amplifier powers a 12-inch bass driver to produce 113dB SPL. This has the same functionality of the 7360A and 7380A, however it has a frequency response of 16-100Hz (120Hz with LFE). An 800W amplifier feeds a 15-inch bass driver to produce a maximum level of 119dB SPL. Note (1): -6dB. (2): SPL at one metre, short term. (3): Or lower. (4):Short term. (5): WxDxH, mm. The 9301A multi channel AES/EBU interface is a 1U rack mounting processor that allows the monitoring of low frequency digital AES/EBU audio signals. 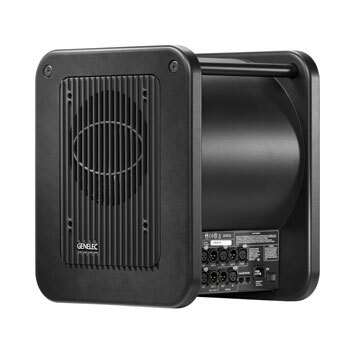 The 7300 SAM series of subwoofers are limited to a single AES/EBU input and single output, however they can be expanded, when using the 9301A interface, to eight audio channels or to 7.1 channels when the LFE channel is active. Connection to the subwoofer is made via single AES/EBU link cable which carries the sum of all main channel inputs and LFE channel. Daisy-chaining from there can be done by using the digital outputs on any connected subs. The front facing panel features a centralised, illuminating power switch along with four green LEDs that illuminate when an input signal is sensed. All I/O connectivity is on the rear facing panel, including four balanced 3-pin XLR digital AES inputs with corresponding balanced 3-pin XLR AES outputs. AES input 4 doubles as the LFE input. A subwoofer output link is provided via balanced 3-pin XLR, and GLM network connection is via two RJ45 sockets. Mains AC input is via IEC. Mains voltage: 100-240 VAC (50-60Hz). 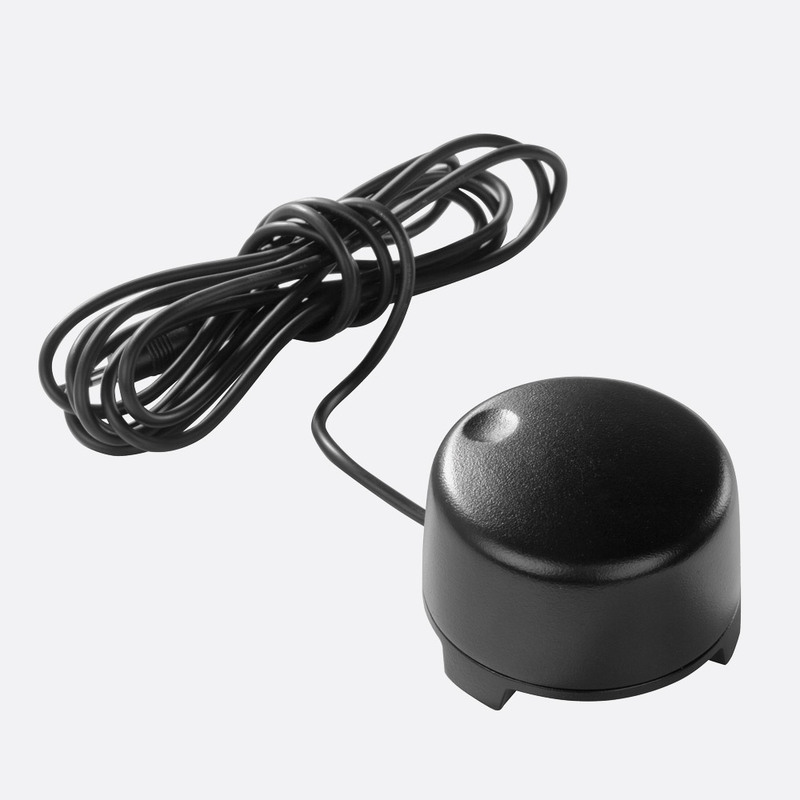 Power consumption: 1W, ISS power saving; 1W, idle; 2W, full operation. Dimensions (HxWxD): 44 x 466 x 211mm. Weight: 2kg. Included accessories: AC mains cable, 1x 5m GLM network cable, operating manual. 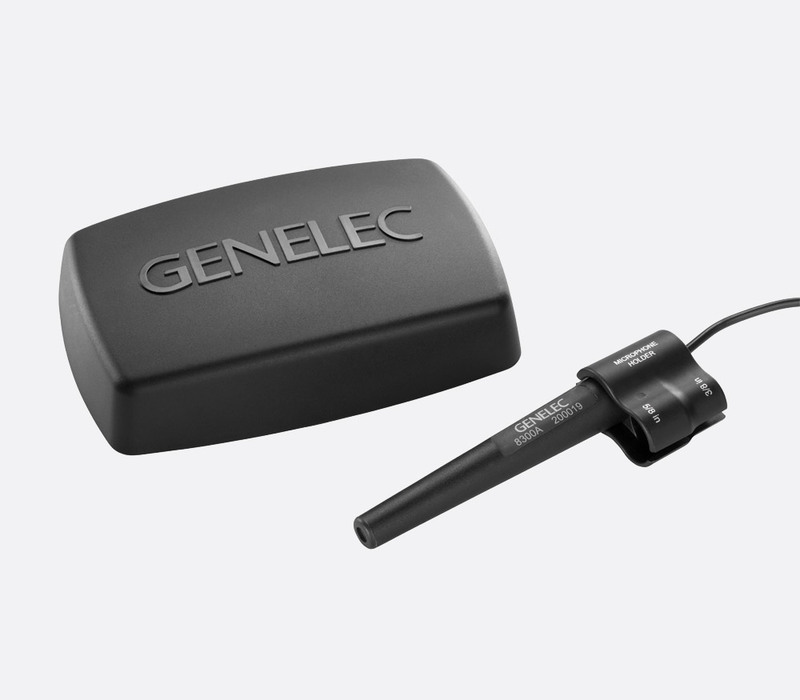 Comprising of GLM network adapter, Genelec 8300A calibration microphone, microphone holder (with both 5/8-inch and 3/8-inch threads) and quick connection guide, this kit is used to link the Genelec GLM3 software (free to download) via the network adapter to 'The Ones' series of monitors and compatible SAM sub-woofers. Once connected, AutoCal calibration may be implemented to adjust monitor levels, frequency responses, time alignment, phase adjustment and determine unlimited setup files for quick recall. The rear face of the desktop GLM network adaptor has a USB 2.0 type B connector that can be used to power the unit via a compatible computer or mains adapter. A yellow LED shows power-on status. A 3.5mm jack provides connectivity to the 9310A volume controller; a second 3.5mm jack allows for the connection of the included 8300A calibration microphone. Two RJ45 network connections link to compatible monitors and are complete with terminator (the latter being optional). 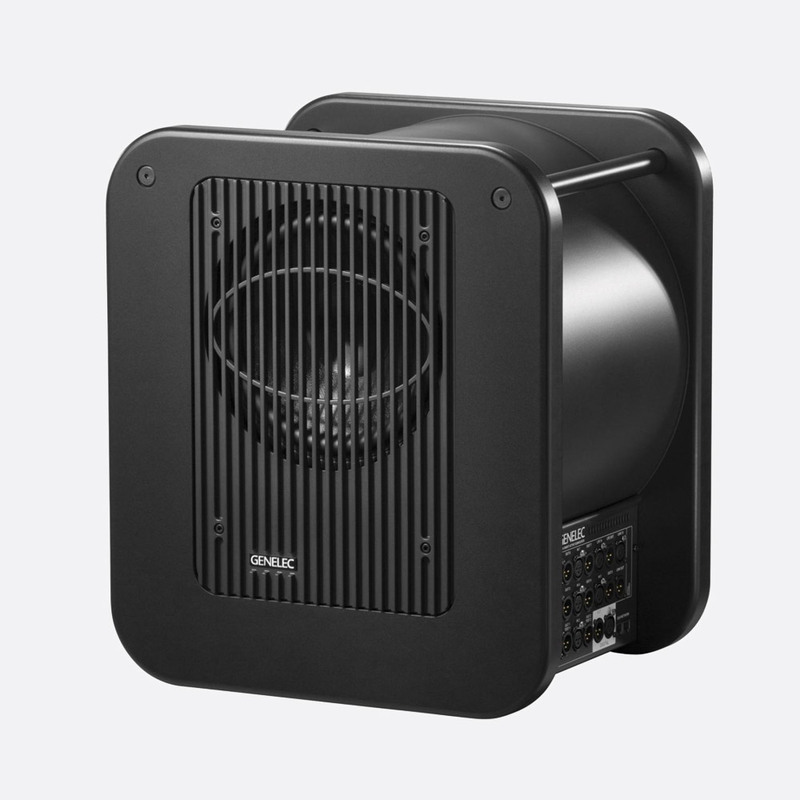 Available in black only, this desktop, rotary, volume controller is compatible with the GLM 2.0 network adaptor (included with 8300-601) to control the volume of SAM series monitors and sub-woofers. A captive cable is terminated with 3.5mm stereo jack plug.